An award-winning country inn offering victorian hospitality and comfort. Overlooking picturesque Columbia State Historic Park, in the heart of the gold country. This handsome Columbia victorian began receiving guests in early 1992 after a complete renovation by owner Samantha O’Brien. 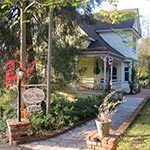 The two-story gem, considered one of Columbia’s finest homes at the turn of the century, sits on a hill across from the town’s 1860’s vintage school house.